What types of ammo are used in Romanian AKs? Which round is the best? Which brand works the best? Whats the difference between steel case and brass cased rounds? What is the difference between Hollow Point(HP) and Full Metal Jacket(FMJ) rounds? There are 3 diffrent types of ammo used in Romanian AKs. Listed below is the three types and a quick explanation. The above pic was created by J.A Freeman, his site is located in the links section. 7.62*39mm is the orginal AK-47 round. Comparable to the Winchester 30-30 in power, this round is one of the perfect blends of power and performance. The advantages of this round is the very low cost, high muzzle energy, and it is now domestically manufactured. Disadvantages of this round is the weight of carrying large amounts of this ammo type compared to the smaller 5.54*39mm round. 5.45*39mm is the new AK-74 round. This round is based on the idea that light weight small rounds can perform as well as the larger bore rifle rounds in combat by "tumbling" once it hits are target, this round is so devasting it has the nick name of the "poison bullet". This advantages of this round are the low recoil, very high velocity, and level trajectory. The disadvantages are its cost is a little more then 7.62*39mm and is not domestically manufactured. 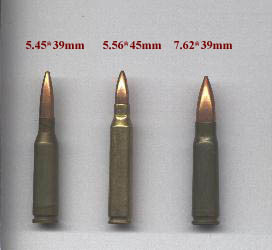 5.56*45mm(.223) is a NATO developed round. This round was never used in an actual military AK except for a few prototypes developed by Romanian to qualify with NATO small arms guidelines. The advantages of this round is the low recoil, low weight, very high velocity, flat trajectory, and it is domestically manufactured. The disadvantages is the cost is slightly more then most russian steel cased rounds and it is not a true ak round. This question is impossible to answer, yet I have people ask this all the time. My answer to this question is what ever round you prefer. Though if I had a choice to chosing a rifle closest to the AK-47 I would go with the 7.62*39mm, on the other hand if I wanted a rifle closest to the AK-74 I would choose the 5.45*39mm. Also don't dis-credit the .223 (5.56*45mm) because its not an orginal AK round, it is a awsome cartridge. Which brand work the best? Again another question that is impossible to answer. It depends on if your going to go plinking or going to compete in matchs. Since I dont compete I usally use Wolf brand ammo(its steel case). AK rifles eat this stuff like candy, its cheap and performs well too. The steel cased rounds are usally cheaper to produce then brass cased, thus the ammunition cost less. Though one should be mindfull that the lubricating lacquer can get messy. Make sure you clean your rifle once home from the range because the lacquer can build up possibly causing a jam( common in high tolerance rifles such as the AR-15, its not a big problem with AK type rifles). Don't let this discourage you from purchasing this type of ammo though, many militarys around the world used this type of ammuntion. The brass cased rounds are usally more expensive to produce but are less messy, and can some times be reloaded. With AK type rifles usally the steel case is used more often, but most match grade and hunting cartridges use brass. If you like to reload your ammuntion then brass is the only way to go. Full Metal Jacket have a metal jacket, usally made out of brass that encloses the core of the bullet. FMJ rounds are designed more for penetration then expansion. The Hollow Point round on the other hand is designed to expand rapidly causing large wound ballistics. 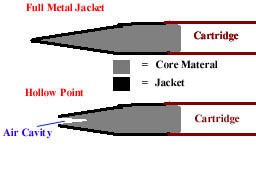 The rapid expansion is caused by the hollow air cavity in the front of the bullet filling up with a water like substance(such as flesh) forcing the bullet to mushroom. Current NATO laws forbid the use of Hollow Points in combat because of the massive wounds they can cause. To sum it up FMJ rounds are better against body armour then HP. On the other hand HP rounds are better against non-armoured soft targets then FMJ rounds. This is why they are used in hunting more often then FMJ.